People don't realize digital-manufacturing solutions can be cheap. On Day 1 of the Smart Industry Conference in September, attendees can tour the Digital Manufacturing and Design Innovation Institute (DMDII) at UI LABS to experience the tools and technologies at the heart of digital transformation. Today, UI LABS Chief Technology Officer Kevin McDunn shares his perspective on demystifying the digitalization process, implementing cheap solutions and adapting technologies to a spectrum of environments. Smart Industry: What piece of technology on the DMDII floor most excites you? Kevin: I am most excited about the new discrete testbed that makes a metal token with DMDII’s vision statement: Every part better than the last. We plan to continually produce parts and collect IoT-sensor data to ultimately drive artificial intelligence improvements back into the process in real-time. We plan on adding a process-industry testbed later this year and use both of these as a springboard for translating improvements into our members’ manufacturing lines. The goal is to de-mystify the technology-integration steps necessary to realize business impact. Smart Industry: Are the assets on display at DMDII applicable for most manufacturers in most fields? Kevin: Many of the technologies are applicable across fields because they involve collecting data, analyzing data and optimizing operations based on data. For example, we have seen process manufacturers glean productivity improvements from technologies used in a discrete assembly line. The common theme is enabling the “digital thread”—a single authoritative source of truth spanning the product lifecycle that enables continuous, accelerated learning. We also have augmented, virtual and assisted-reality technologies that can be adapted to any number of environments to train workers and enable them to collaborate with cyber-physical systems. Smart Industry: What do you most commonly hear from those who tour the DMDII floor? Kevin: People often say that they didn’t know digital-manufacturing solutions could be low or no cost—while we have some cutting-edge technology that is more appropriate for large manufacturers, we also have demonstrated solutions that small manufacturers can implement cheaply and quickly, with commercially-available equipment and software tools. Want to tour DMDII? 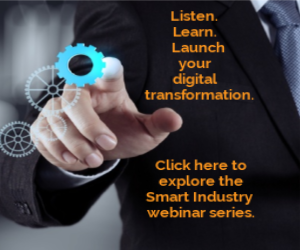 Learn more and register for the 2018 Smart Industry Conference here.